Located in the newly remodeled Plaza Hotel, Pop Up Pizza is your go-to destination for delicious, late-night pizza in the 89109. Come in anytime from 11 AM until 2 AM and get your chompers around our fresh, homemade pizza. You haven’t had pizza until you’ve had it Downtown-style. Pop Up Pizza makes for an intimate, cozy dining experience marked by distinctive, modern decor and beautiful artwork accenting the familiar pizzeria feel. Our unique menu and homemade process is what makes us the best pizza in Las Vegas. In the mood for something else? We’ve got that, too! Try our fried pickles, chicken tenders, and parmesan fries. We’re also vegan friendly, so don’t be afraid to invite your entire crew to grab a slice. Pop Up Pizza is now delivering mouthwatering pies from our oven to your doorstep. 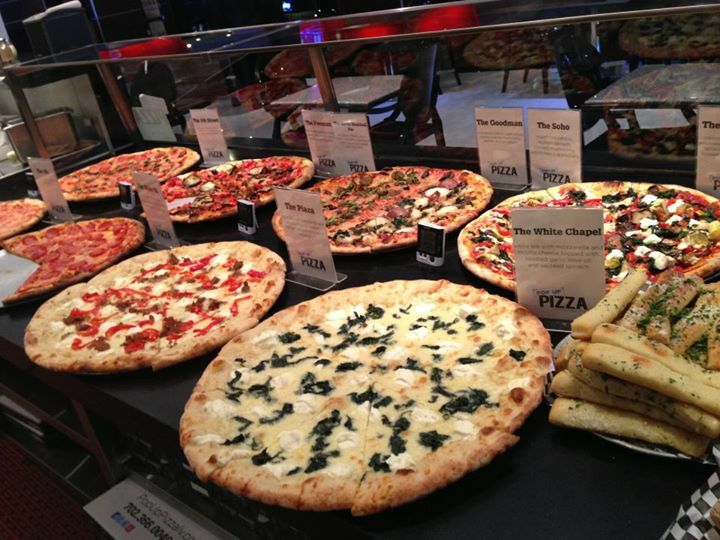 Pick one of our signature pies including The Goodman with mozzarella, caramelized onions ,roasted mushrooms, spinach, and red potato, or The Newport topped with dollops of ricotta, roasted artichoke, peppers, eggplant, spinach and mushrooms topped with a garlic infused olive oil. Don’t forget to ask about our specials, contests and coupons! Call us at (702) 366-0049 for more information.